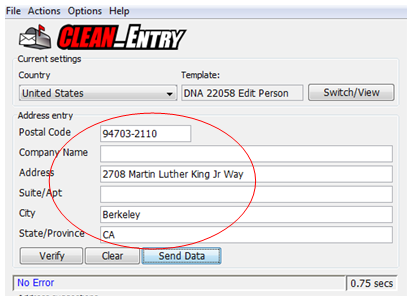 Address Cleansing can be used in real-time by service agents to verify addresses before they enter your marketing or client database. 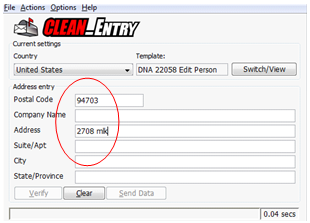 CLEAN_Entry provides real-time address verification and cleansing and helps ensure that a valid address is entered and deliverable. Front-office staff can save significant time by reducing the keystrokes required to validate a mailing address. Service agents can spend less time typing and more time assisting your client, either on the phone or in person. By validating the address before it is stored in your application database, you can reduce the amount of undeliverable mail. The address is valid, standardized, and deliverable, your business can be sure that any mail sent to the address will be delivered. By validating the address with your client on the phone or in person, businesses can meet government compliance regulations, like FACTA, Patriot Act, etc. In addition, internal audits will be more readily passed. Quality mailing addresses ensure that communication with clients is reliable. Business users can count on valid data when analyzing client and prospect data for decision making. Critical marketing activities designed to grow your business will also leverage reliable, deliverable addresses. Without them, marketing literature that might generate new sales may not arrive at the desired destination. When combined with Batch Address Cleansing and the rest of the Address Management Suite, businesses can be confident they are tackling undeliverable address management in the right manner. ROI is significant and quick through the reduction in time spent entering addresses, less returned mail, lower postal service costs, and improved marketing data.